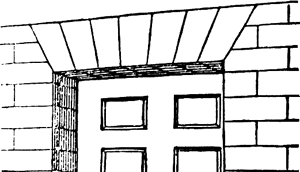 An arch whose soffit (i.e., lower face) is horizontal. Also called a Dutch arch, French arch, jack arch, or straight arch. A Jack Arch roof is usually formed with number of 4. Fig 3: Table for selection of Rolled Steel Beam for Jack Arch Roofing (1934). This proves that module for Jack Arch in a particular bungalow was dependent on the space requirements within in the limitations 4-6' but not like Indian house where a space was dependent on wooden beam limitations. Besides the roofing of the buildings and giving strength to structure the shape of the Jack Arch was most effective tool for ventilation for low and high roof spaces in bungalows. Jack Arch was also used for constructing Double roof to control indoor thermal condition of the rooms (Fig. Jack Arch was a roofing system for Industrial Buildings in Europe whose major components were Steel Girders and Brick Arch. However, the origin of Jack Arch indicates that it was primarily invented to cater the span requirements of Industrial buildings in England but in British India the system had been interestingly extended to roof construction of every type of building. In railway the waste steel in the form Double Headed Rail Joists (DHRJ) was an additional provision and incentive to construct Jack Arch roofing for buildings of every nature without any major cost involvement. After having various experiences the ultimate choice came out in the form of Jack Arch on the basis of simple technique involve in its construction, fast construction, greater structural strength, long life, availability of materials and the most importantly the cost effectiveness. With the Jack Arch roof it became possible to accommodate the European space requirements in Bungalows and buildings of other uses.